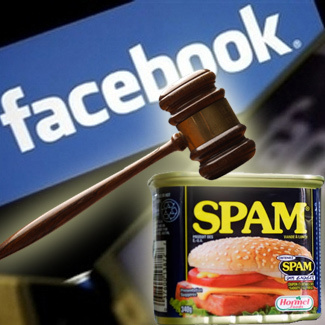 Facebook spamming is increasing day by day and these days its becoming home for spammers.Latest one is a video spam titled [Video] Yeah!! It happens on television posing some funny pornographic content to attract the users of Facebook.In this article I am going to reveal how this spam/virus (whatever you say) works and how can you protect yourself from this. Warning:I did this inside a security sandbox.If you want to do the same experiment,I request you to do inside a security sandbox.Before doing this clear all your browser data(Cookies,Cache etc etc.). It can happen to anyone! I dare you can watch this. Lol Checkout this video its very embracing moment for Her. Once you click on the malicious link,Sometime it may ask you to share it with your friends before you can watch. Here lies the first trap. When the page will fully load the you get a message "Divx Missing Plugin". As you install the extension the video will automatically shared on your wall and will get notified to all of the friends in your profile. So if we look at the source code of that page or using firebug,we can see many lines of code but only following is very important. From this its clear that the its loading the link 'http://failvids.net/yt/plugin.html' inside an iframe. So opening that link http://failvids.net/yt/plugin.html main browser i found some interesting lines of code. Now if you go little but up side of the source code of the page you can see following lines of code. After that we have got our function installer()as i have mentioned earlier. Inside this function you can see its checking if the users browser is chrome then it will take the user to "http://failvids.net/yt/youtube.crx"
And if the browser is Firefox it will take the user to this url. "http://failvids.net/yt/youtube.xpi"
Now do you know what is .xpi and .crx file.?? Well An XPI file is a Mozilla/Firefox Browser Extension Archive file. and .CRX file is Chrome Browser Extension Archive file. Whatever Firefox add on or chrome extension you use it comes in .xpi or .crx package.If you open that file in the same browser you will not be able to understand.You will just get a window like this. 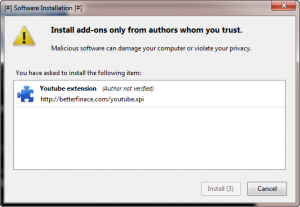 My next target was to download those extension package files to know the functionality .But the main problem when downloading Browser Extension main package file is,you cannot download it in the same browser.And you should not try because its very risky. So its better to use any download manager.After downloading those files i have decided to break the .crx file which is for Google chrome. Unpacking the .crx file of .xpi file is not a big deal.Just rename the youtube.crx file to youtube.rar and unpack it using winrar. The main code for this malicious extension file is in "go.js" file. I tried to access http://failvids.net/yt/script.js and found following lines of code.The server was very slow but after waiting 4-5 min i got this. The main code was in "extra.js" file and it looks like this. From the code we can see that its first its calling the function FBFBFB321();.This fucntion is responsible for faebook cookie Hijacking. From the function we can see that its checking the url location. 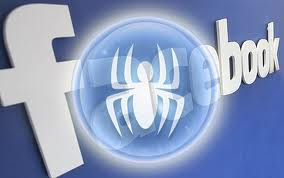 Note: if its http://facebook.com or https://.Then grab the cookie from browser. As Facebook cookie is always marked as secure then client side java scripts will not be able to read those cookies.so the user is safe. After that we can see its calling the function function fb_comparte().This function is responsible for generating random fake plugin comments.You can see from the code that its using Ajax request to http://www.facebook.com/ajax/profile/composer.php. Well this is the main evil fucntion.Analyzing that function i found that first its reading the user cookie c_user.the c_user cookie is nothing but the id of your Facebook profile. Now the most critical feature of this virus is user tracking feature. If you look at the function readCookie() you can see it randomly adds cookie to your browser and track your activity on internet. How to prevent this spam! Don’t ever click on the link given with this content. There are many more stuffs,Right now its not possible for me to explain the entire code.I hope It will help you!Feel free to drop comments.Thanks.